You asked for it, and you got it! This product contains ALL my Mentor Sentences for fourth grade Common Core State Standards in a single, 112 page download. If you're looking for a better way to model and teach revising and editing, mentor sentences are the perfect tool. These pages students take the grammar concepts they are learning about and apply it in their own writing, right away. 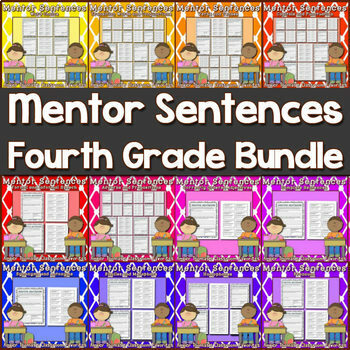 * 56 Mentor Sentences worksheets: Each worksheet has 2 Mentor Sentences for students to analyze and compare. * 56 Definitions and Examples boxes: These can either be glued onto the page itself or into an Writing/Editing/GUM notebook as a study guide for future reference. These come 8 to a page in order to conserve copy paper. If you want to try out some of these Mentor Sentences before you buy, check out the FREE Mentor Sentences pages in the preview! Try these worksheets and watch how they help you elevate the quality of their writing! Or, to view preview pages for every section in this bundle, check out my Mentor Sentences Category to view each individual part. Any claims of correlation or alignment to the CCSS are solely those of Amber Thomas and have not been evaluated or endorsed by the NGA. Amber Thomas. is the sole creator of this product and does not claim endorsement or association with the creators of the CCSS.